Happy St. Patrick's Day, magpies! To celebrate the holiday, we're spending today with one of the sparkliest shamrock tiaras around: the diamond and pearl tiara worn by the Marchionesses of Dufferin and Ava. 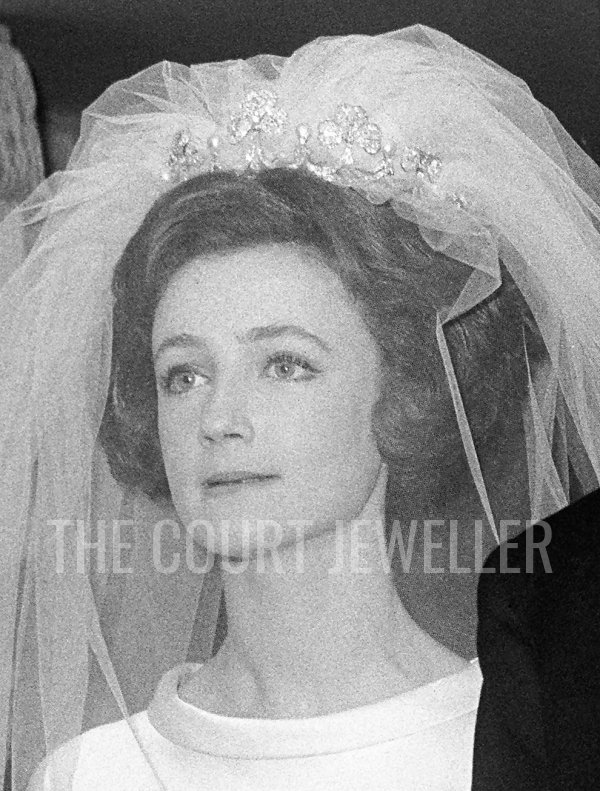 The diamond and pearl tiara was commissioned around the time of their wedding. Hariot often paired the tiara with a suite of diamond star jewelry, as seen in the illustration above by Charles William Walton. 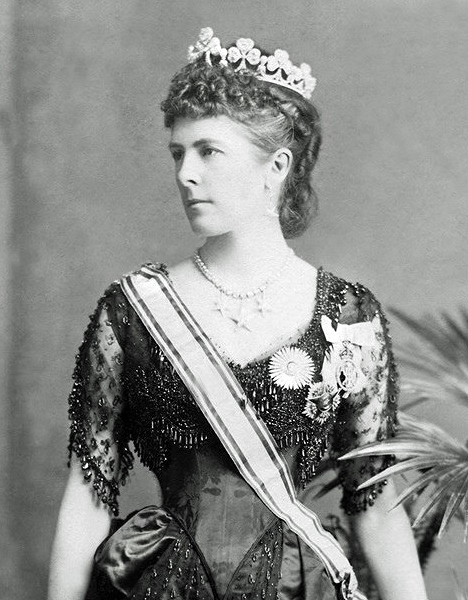 She's also wearing the stars with the shamrock tiara in this photographic portrait, which was taken by Bourne and Shepherd around 1885. Hariot needed a substantial jewelry box, as her husband served as both Viceroy of India and Governor-General of Canada during Queen Victoria's reign. 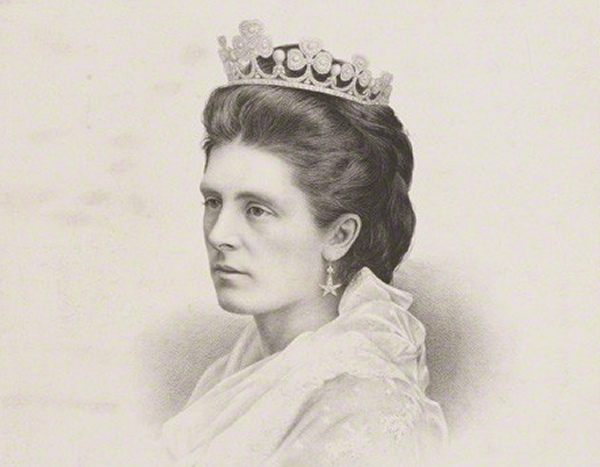 Even after Lord Dufferin's retirement from government service, Hariot's tiara sparkled on the social scene. One London paper described her appearance at an 1891 ball given by the King and Queen of Italy: "The Marchioness of Dufferin and Ava wore pearl-grey silk, embroidered elaborately in silver. On her head she wore a tiara of shamrocks in diamonds, and across the bodice of her dress gleamed a number of Orders." 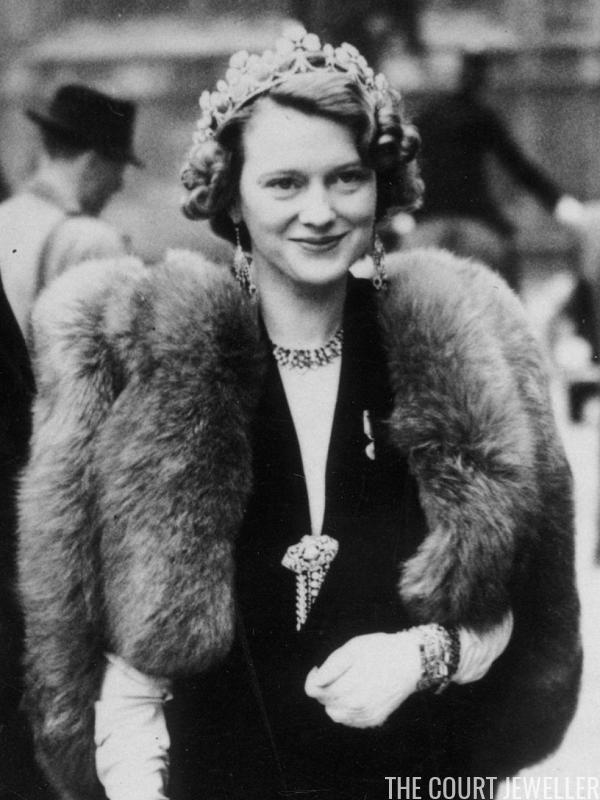 In the twentieth century, the tiara became a favorite of Maureen, wife of Basil Hamilton-Temple-Blackwood, 4th Marquess of Dufferin and Ava. Born Maureen Guinness, she was a granddaughter of the 1st Earl of Iveagh and an heiress of the Guinness brewing fortune. In June 1935, five years after her wedding to Lord Dufferin, Maureen wore the tiara for the State Opening of Parliament. Note that she tipped the tiara backward, wearing it almost like a headband, to make it fit better with the fashionable hairstyles of the era. 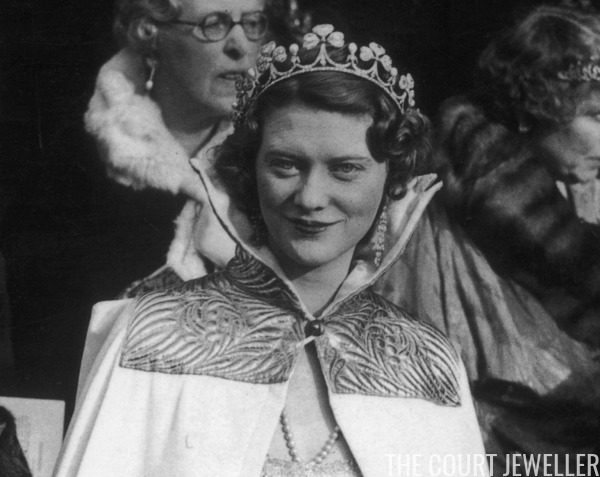 Maureen also wore the tiara at one of the last glamorous pre-war State Openings of Parliament, held in November 1938. Sadly, the war would make Maureen a widow; Basil died while serving in Japan in May 1945, shortly before his 36th birthday. 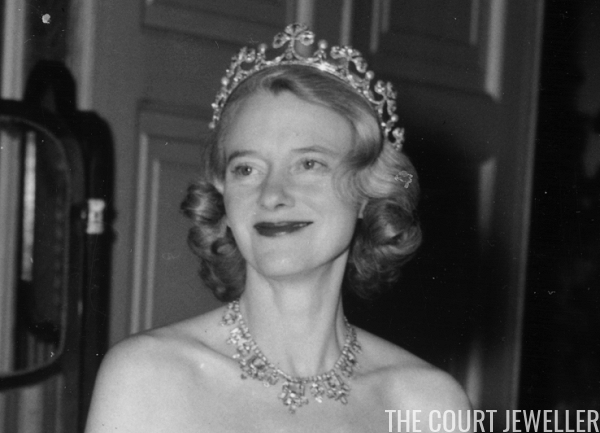 In July 1952, Maureen wore the tiara for a debutante ball given at the Hurlingham Club. She was accompanied by her daughters, Lady Perdita and Lady Caroline. Caroline, a writer and novelist, became equally well-known for her marriages to the artist Lucien Freud and the poet Robert Lowell. It was at Caroline's coming-out party that Maureen and the shamrock tiara were involved in a rather unfortunate incident. 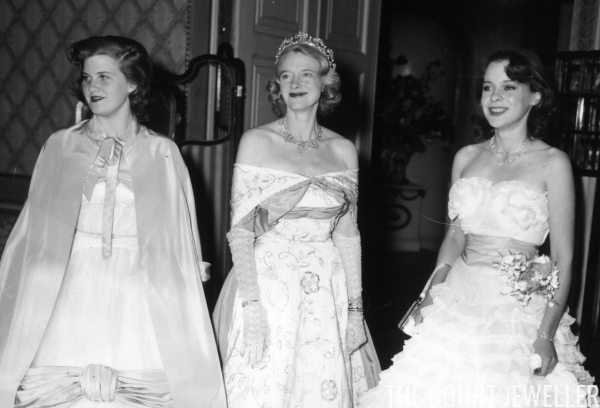 Caroline's daughter, Ivana Lowell, explained in her memoirs, "At my mother's coming-out ball, attended by Princesses Elizabeth and Margaret, my grandmother 'overserved' herself champagne and slipped on the dancefloor, cracking the priceless shamrock-shaped family tiara. She never drank again." Photo licensed to The Court Jeweller; DO NOT REPRODUCE. Repaired and back in sparkling shape, the tiara's next prominent wearer was Maureen's daughter-in-law. Lindy Guinness married her fourth cousin, Sheridan Hamilton-Temple-Blackwood, 5th Marquess of Dufferin and Ava, in a sparkling Westminster Abbey ceremony in 1964. "Lindy with the glitter of her copper hair and the famous Dufferin and Ava tiara of shamrocks formed of huge diamonds making a halo under her pearly tulle veil, smiled serenely on the arm of her handsome father," wrote columnist Eleanor Lambert. Royal guests at the wedding included the Aga Khan (whose mother was once married to Lindy's father), Princess Margaret and Lord Snowdon, Princess Margaretha of Sweden and John Ambler, and Princess Alexandra and Angus Ogilvy. Sheridan and Lindy had no children. They had married in spite of Sheridan's homosexuality, and when he died in 1988, the marquessate went with him. Today, Lindy is still alive and managing the family estate in Northern Ireland, Clandeboye. The tiara, however, lives in London: the family has loaned it to the Victoria and Albert Museum, where it is on display in the museum's fabulous jewelry rooms.